The AT267 Series of "T" adapters are designed for connecting two telephones or associated equipment to an existing jack. All units are Ivory in color. Equipped with two 6 pos., 4-cond. jacks and one 6-pos., 4 cond. plug. Wired for connecting 2 telephones and/or ancillary devices to separate outside lines through a single 4 conductor modular jack wired for terminating 2 lines. Equipped with one 6 pos., 2-cond. 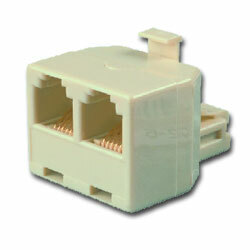 jack for Modem, one 6-pos., 4 cond. jack for Voice transmission and one 6-pos., 4-cond. plug with the tip and ring bridged to both jacks. Designed to combine voice and data trans. through a single modular jack. Equipped with two 6-pos., 2 cond. jacks and one 6-pos., 4-cond. plug. Designed to split 2 telephone lines from a single modular jack to 2 individual modular jacks. Equipped with two 6-pos., 6-cond. jacks and one 6-pos., 6-cond. plug. Provides connection for two 6-pos., 6-cond. line cords wired to a single 6-pos., 6-cond. modular plug. Equipped with one 6-pos., 4-cond. jack, one 8-cond. jack with shorting bars on pins 1-4 and 5-8 and a 6-pos., 4-cond. plug. designed to permit quick connection of one telephone and one automatic dialer to the same line without changing the existing installation.